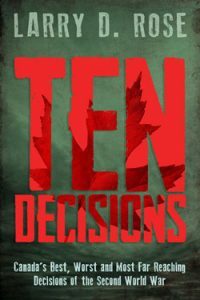 Larry D. Rose is the author of the newly-released Ten Decisions: Canada’s Best, Worst and Most Far Reaching Decisions of the Second World War. He is also the author of Mobilize! Why Canada Was Unprepared for the Second World War, published by Dundurn in 2013. 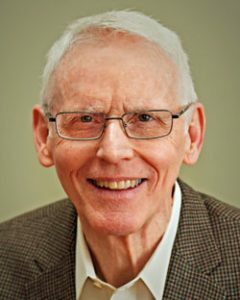 His articles on Canadian military history have appeared in the Globe and Mail, the National Post and Esprit de Corps magazine. Rose was born in Trail, BC. He has B.A. and M.A. degrees in Political Science and Public Administration from the University of Victoria. He worked for more than 45 years in broadcasting and spent four years as an Assistant Professor of Broadcast Journalism at the BC Institute of Technology in Vancouver. For the 24 years prior to his retirement Rose worked for CTV News in Ontario. For six years he was the Producer of the “CTV National News with Lloyd Robertson”. In his military career Rose was commissioned in the Royal Canadian Armoured Corps in 1966. He later served in the British Columbia Regiment in Vancouver. He retired as a captain. Rose is a member of Branch 165, Royal Canadian Legion and the Royal Canadian Military Institute. He lives in Toronto.